This flavorful chicken breast recipe is elegant enough for guests or a weekend family dinner. Chicken breasts are flattened, filled with basil and cheese, rolled in breadcrumbs, then baked to perfection. 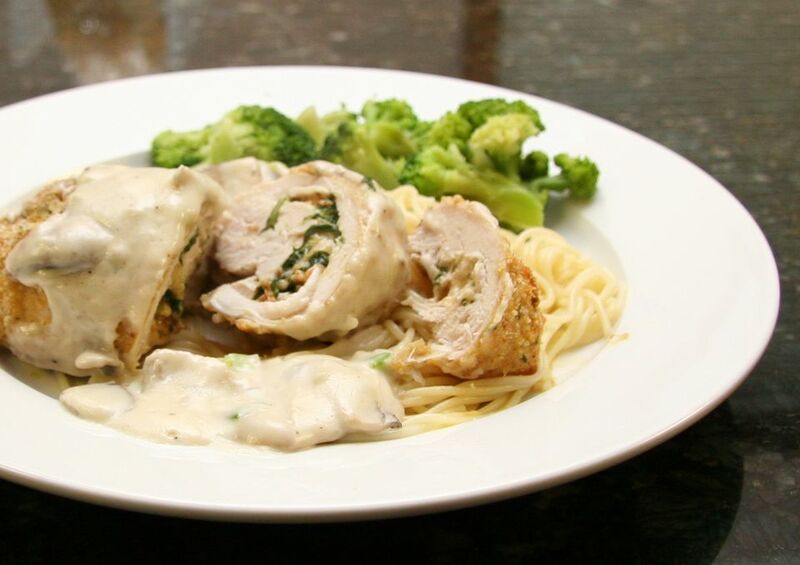 The mushroom sauce provides the perfect topping for these chicken breast rolls. They're wonderful with rice or pasta, along with a tossed salad. Heat oven to 375 F. Lightly oil a baking pan or spray with nonstick cooking spray. Wash chicken and pat dry. Put the chicken, one piece at a time, in a food storage bag and pound gently with a meat mallet or other heavy object until about 1/4 inch thick. Repeat with all of the chicken breasts. Sprinkle with salt and pepper. Saute the garlic in butter for about 1 minute, just to soften. Combine the garlic with basil leaves. Spread basil mixture over each chicken breast; top with a slice of Mozzarella cheese or a little of the shredded Mozzarella cheese. Roll the chicken up and secure with toothpicks. In a wide bowl, combine the breadcrumbs and parsley. Carefully dip the rolled chicken breasts in the egg; turning to coat well, then coat with breadcrumbs. Arrange the chicken breast rolls on the baking sheet. Bake for 30 to 40 minutes, or until the chicken is thoroughly cooked. Heat 3 tablespoons of butter over medium-low heat. Add the mushrooms and cook until tender and browned. Add garlic, green onions, 1/4 teaspoon salt, and a dash of pepper. Cook, stirring, for 1 minute longer; add the flour and stir until well blended. Add the chicken broth and simmer for about 2 minutes. Add cream and heat through. Serve the chicken with the sauce, along with noodles or rice and a side vegetable.